The holidays are well and truly here, and what better way to celebrate than with an extra dose of kindness? Let the kindness commence! Look out for more Kindness Stories in the coming weeks, where we’ll share the results of our #HolidayKindness acts. In the meantime, don’t forget to follow Random Acts on social media for all the latest updates. Happy holidays from all at Random Acts! 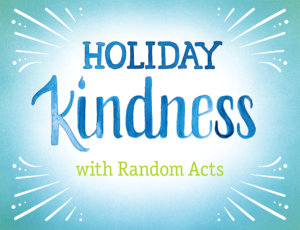 Have an idea for an act of #HolidayKindness of your own? Random Acts provides support for acts of kindness all year round — head over to our acts proposal page to find out how you can get involved!